A sportsguard is a type of mouthguard that is commonly used for the prevention of sports-related injuries. You have the power to prevent injury! According to studies conducted by the American Dental Association, in the 1950’s, oral and facial injuries were responsible for 27-50% of all sport-related injuries depending on the sport, many of which would require lifetime dental rehabilitation. 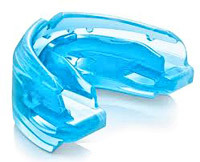 Since then mouthguards have become a standard protective measure in many contact and non-contact sports, and help to dramatically reduce the number and severity of dental and facial injuries. One should always remember that total rehabilitation costs for a single knocked-out tooth is more than 20 times higher than the cost of a custom-made professional mouthguard! Multiple studies have shown that mass manufactured “boil and bite” types of mouthguards offer minimal effectiveness due to having nearly no adjustment and trimming options and therefore inevitably poor fit, low comfort, and frequent interference with the athlete’s breathing and speaking ability. That is why we always recommend custom-made professional mouthguards to our sporting patients to ensure a high level of protection and comfort for your teeth. According to the American Dental Association, more than 200,000 oral injuries are prevented annually in our country by sports mouthguards. So if you or a loved one are into sports and want to greatly reduce oral injuries or prevent them altogether, don’t hesitate to contact our office for a custom mouthguard fitting today!